FAREWELL BO SCHEMBECHLER UofM Michigan Stadium picture photo print for sale - This unique and rare 'FAREWELL BO' Bo Schembechler Memorial Service photo is of the U of M Michigan Stadium Ann Arbor giant scoreboard sign at the South End of The University of Michigan football Stadium. Across the Big M in lights was the lit sign wishing a fond Farewell to Michigan Football Coach Bo Schembechler as the public memorial service for this much loved University of Michigan football legend was conducted inside the University of Michigan Stadium on Nov. 21, 2006, just several days after Bo Schembechler passed away at the age of 77. As the Memorial Service was taking place inside, I decided to talk a quiet walk around the outside perimiter of the Stadium where Bo had vanquished many opponents during his illustrious career as The UofM football coach. 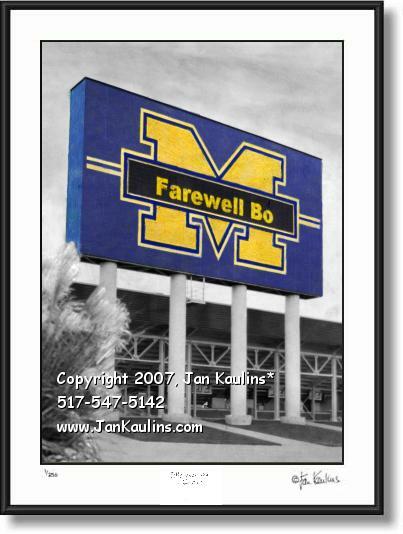 As I looked up I saw the words scrolled across the Big M scoreboard sign -- 'Farewell Bo'. Once the Memorial Service was concluded the lights for this message went out on the marquee. This 'Farewell Bo' photo captured one of the last official farewells to this great man and would make a wonderful momento to any of the many many fans that this man had. This color 'Farewell Bo' Schembechler photo picture print WAS MADE FROM AN ORIGINAL BLACK AND WHITE PHOTOGRAPH that has been hand-colored by noted artist/photographer Jan Kaulins. SEE THE OTHER ANN ARBOR AND U OF M PHOTOS ON THIS WEBSITE BY CLICKING THE 'RETURN TO...' LINK ABOVE THIS PHOTO NEAR TOP OF THIS PAGE.